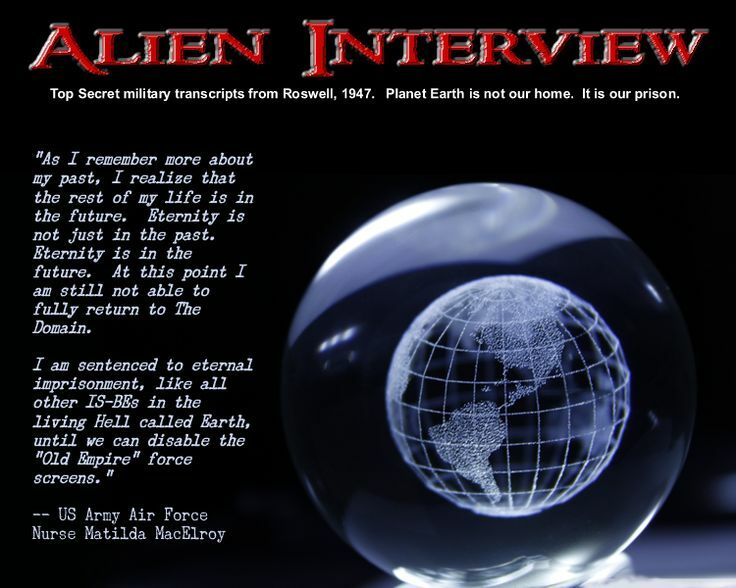 It has been nearly 5 years since the Alien Interview transcripts were published, as requested by Army Air Force Nurse MacElroy. (Read her letter below) It has now been 66 years since the Roswell crash incident in 1947 revealed that we are not alone in the universe. The pilot of the crashed saucer revealed a great deal during the interviews that were conducted over the following 6 weeks. ALL of that information was suppressed by the U.S. Government, until 2008 when the interview transcripts were published in the book ALIEN INTERVIEW. If you have read these transcripts, you will realized WHY the Roswell incident, and the interview transcripts were so heavily and thoroughly hidden and covered-up! These interviews reveal — for the first time in Earth history — the straight forward, simple fact that Earth is a Prison Planet! Further, that all of the Immortal Spiritual Beings (Is-Bes) on this planet are NOT native to this planet. Finally, that the “Old Empire” beings who established Earth as a prison planet more than 10,000 years ago, has been conquered by a new intergalactic invasion force, called The Domain. The influence of the “Old Empire” prison system operation are can be seen everywhere on planet Earth, if you are brave enough to LOOK. The “prison guards” — who are also prisoners with amnesia — are quickly advancing a new Global Totalitarian Socialist Police State in the name of a “New World Order”. The ONLY PURPOSE and ACTIVITY of these criminally psychotic beings is to PREVENT ESCAPE FROM THIS PRISON! In an excerpt from the following letter written by the Army Air Force nurse who conducted the “alien interviews”, she reveals the following advice that is VITALLY IMPORTANT to the existence of every living being on Earth. Therefore, a small group of individuals have now dedicated themselves to the task of COMMUNICATING this information to as many people as possible! I invite you to join us in this effort. Factually, if we continue to remain silent and inactive, every being on this planet will perish here on Prison Planet Earth, and will be lost for all Eternity.